Casie started her equine journey at the early age of two, riding, grooming and learning how to deal with the family pony. By age five she joined4-H, where she spent the next thirteen years soaking in all 4-H has to offer, including competing in western pleasure, reining, hunters, trail and gaming. At age twelve she started and trained her first horse, “Mikey.” She successfully competed with Mikey at local shows, as well as 4-H. In less than one year she showed Mikey at the state level as a three-year-old, taking 9th place in reining! She also competed successfully in Western pleasure at American Quarter Horse Association shows statewide on “Molly,” another horse she broke and trained herself. At age fourteen, Casie started breaking colts for Donny Clark, a multiple Non-Pro World Champion reiner. While with Donny, she helped start colts and exercise broke- reining horses. Reining is widely known as the western form of dressage. By age sixteen she was competing on the National Reining Horse Association circuit, traveling up and down the east coast showing her horse “Pam,” who was a talented, athletic horse that was passed over by other trainers because of her strong will. During this time she collected and won the Eastern Pennsylvania Reining Horse Association year-end high points award in the rookie class division. 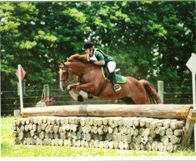 While taking the time to earn a Bachelor of Science degree in marketing and finance from Penn State University in 2002, Casie decided to cross train Pam to do Eventing. After only 3 months, she started competing in the Beginner Novice division. She successfully showed Pam up through Training level, while being the only rider ever to sit on Pam in this discipline. Eventing is the equestrian triathlon. The three components of eventing are dressage, stadium jumping and cross-country. Preparing a horse for eventing is no small task and displays an individual’s true talent for training horses. Virtually all desired attributes of a well-trained horse are covered. The art of dressage displays balance, rhythm and suppleness in all its designated maneuvers. Stadium jumping tests the technical jumping skills of the horse and rider, including obedience and fitness. The final challenge is the all-out endurance test for both horse and rider which is cross-country. Both horse and rider must be in excellent shape and need to be brave and trusting of each other. Casie’s next endeavor was to breed, raise and train warmbloods, which she has been doing for almost ten years. Her breeding program included some of the top Oldenburg stallions, such as Rubenz and Sempatico M. All of her foals have been selected as “premium rated” at their inspection. She has been a member of the United States Eventing Association, Certified Horseman’s Association, International Sporthorse Registry, Oldenburg Registry North America, American Quarter Horse Association, National Reining Horse Association, American Youth Quarter Horse Association, and Eastern Pennsylvania Reining Horse Association. 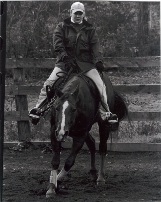 Casie’s lifetime of personal experience with horses is diverse and extensive. 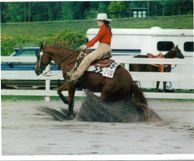 Additionally, her calm, easy-going demeanor makes for an excellent instructor of riders in all age groups and disciplines. Her approach to training emphasizes softness, suppleness and teaching the horse and rider how to properly balance themselves for any event. It’s all about lightness!